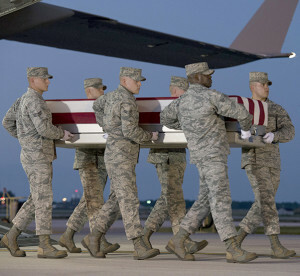 An Air Force carry team carries the remains of Maj. Troy Gilbert Oct. 3, 2016, at Dover Air Force Base, Del. Gilbert was killed Nov. 27, 2006, when his F-16C Fighting Falcon crashed 20 miles northwest of Baghdad. 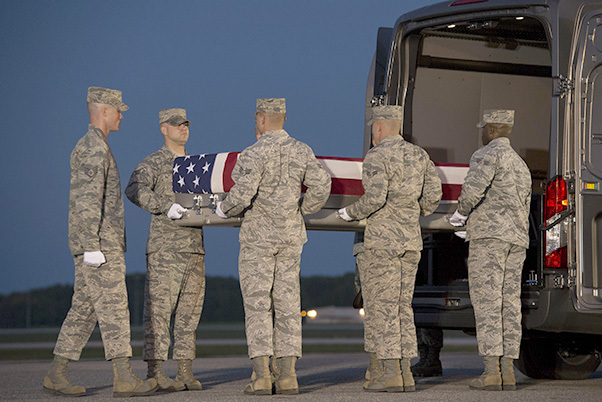 U.S. forces were able to return the F-16 pilot’s remains approximately 10 years after he was killed in combat operations saving the lives of U.S. service members and coalition allies. This week, nearly 10 years after he was killed in combat operations in Iraq, U.S. forces brought home the remains of F-16 pilot Maj. 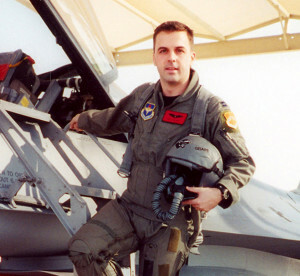 Troy Gilbert, who died saving the lives of U.S. service members and coalition allies. On Nov. 27, 2006, Gilbert and his wingman were flying back to base when they got the call that an AH-6 Little Bird helicopter had been shot down. Enemy insurgents had the crew, along with the coalition forces called in to support, outnumbered and pinned down. With little fuel left, the two F-16 pilots changed course and headed to the hotly contested warzone just outside of Taji, Iraq. Due to fuel limitations, the pilots were forced to take turns refueling and providing air support to the troops under fire. By the time Gilbert was able to make his first approach, the calls for support had grown more urgent. Insurgents attacked with truck-mounted heavy machine guns, rocket-propelled grenades, small arms fire and mortars. 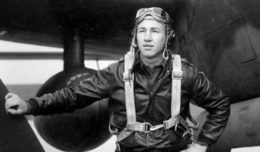 Gilbert, a friendly Texas Tech graduate dubbed “Trojan” by his fellow aviators, acted quickly and aggressively. To avoid causing civilian casualties by dropping the bombs he carried under his wings, he opted for low-altitude strafing passes using his 20-milimeter Gatling gun. Gilbert made his first pass, destroying one truck and dispersing the others which were almost upon the friendly forces 20 miles northwest of Baghdad. Keeping his eye on the enemy targets moving at high speed, he conducted a second pass from an even lower altitude. He continued firing on the enemy forces during a dynamic and difficult flight profile, impacting the ground at high speed on the second pass. Reports say the crash killed him instantly. However, al Qaeda insurgents took Gilbert’s body before U.S. forces were able to get to the scene, leading to 10 long years of a family waiting for their husband, father, son and brother to come home. An Air Force carry team carries the remains of Maj. Troy Gilbert as the official party renders honors during a dignified transfer Oct. 3, 2016, at Dover Air Force Base, Del. Maj. Troy Gilbert, an F-16 Fighting Falcon pilot, was killed Nov. 27, 2006, in an F-16 crash 30 miles southwest of Balad Air Base, Iraq. Gilbert was the standardization and evaluation chief for the 332nd Expeditionary Operations Group and was deployed from the 309th Fighter Squadron from Luke Air Force Base, Ariz. He was survived by his wife Ginger Gilbert Ravella, sons Boston and Greyson, and daughters Isabella, Aspen and Annalise. In a letter to Gilbert’s wife from the Army element commander whose troops the F-16 pilot was supporting that day, the commander wrote that Gilbert saved his unit from “almost certain disaster” as insurgents prepared to attack their position with mortars. “Major Gilbert’s motivation to succeed saved the lives of the helicopter crew and other coalition ground forces,” then-president of the accident investigation board and current Air Force Chief of Staff Gen. Dave Goldfein said in his safety report. 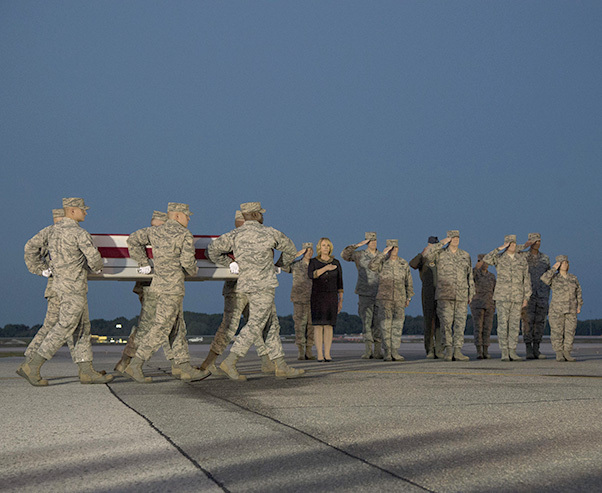 Goldfein saluted as Gilbert’s remains were solemnly carried from the C-17 that brought him home this week. Also on hand was Gen. Robin Rand, Air Force Global Strike Command commander. Rand regarded Gilbert as a friend, first meeting him when he was an F-16 pilot at Luke Air Force Base, Arizona, and eventually crossing paths again when Gilbert became his executive officer at Luke. The relationship continued when Gilbert served under Rand’s command in the 332nd Air Expeditionary Wing at Balad Air Base, Iraq in 2006. An Air Force carry team places a transfer case carrying Maj. Troy Gilbert’s remains into a vehicle Oct. 3, 2016, at Dover Air Force Base, Del., for transport to the port mortuary and identification center, a part of the Armed Forces Medical Examiner System. Gilbert died Nov. 27, 2006, when his F-16C Fighting Falcon crashed while he was providing close-air support to special operations forces about 30 miles southwest of Balad Air Base, Iraq. His remains were finally returned to the U.S. on Oct. 3, 2016. Following the accident, U.S. forces recovered DNA which provided enough information to positively identify Gilbert. His funeral, with full military honors, followed Dec. 11, 2006 at Arlington National Cemetery. In September 2012, some additional, but very limited, remains were recovered and interred during a second service Dec. 11, 2013. Then, on Aug. 28, an Iraqi tribal leader approached a U.S. military adviser near al Taqaddam, Iraq, and produced what he claimed to be evidence of the remains of a U.S. military pilot who had crashed in Iraq during Operation Iraqi Freedom. The Iraqi said he was a representative of his tribe, which had the remains and the flight gear the pilot was wearing when he went down. The tribal leader turned over the evidence to the U.S. adviser who immediately provided it to U.S. experts for testing at the Armed Forces Medical Examiner System at Dover Air Force Base, Delaware. AFMES confirmed the evidence Sept. 7 through DNA testing. With this verification, U.S. military advisers in Iraq reengaged the tribal leader who subsequently turned over the remains, including a U.S. flight suit, flight jacket and parachute harness. Gilbert’s remains, promptly prepared for return to the U.S. for testing, arrived Oct. 3 at Dover AFB. 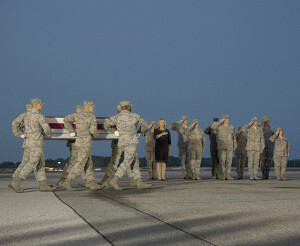 Airmen at Dover conducted a dignified transfer upon arrival at the base, which was attended by Gilbert’s family, base officials and senior Air Force leaders, to include the Secretary of the Air Force Deborah Lee James, Goldfein, Rand, and Chief Master Sergeant of the Air Force James Cody. AFMES confirmed Oct. 4 through dental examination and DNA testing that all remains received were those of Maj. Gilbert. His lost remains had been recovered and fully repatriated. Maj. 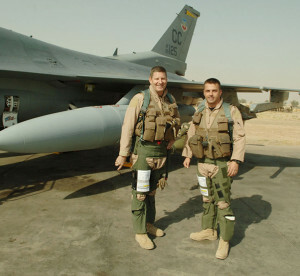 Troy Gilbert stands beside Gen. Robin Rand, the Air Force Global Strike Command commander, in front of the F-16 Fighting Falcon he was flying Nov. 27, 2006, when he was killed 30 miles southwest of Balad Air Base, Iraq. Gilbert served under Rand’s command in the 332nd Air Expeditionary Wing at Balad AB in 2006. “First and foremost I want to say God is forever faithful,” Gilbert Ravella said. “He was good whether this recovery ever happened or not. But we praise Him, in His infinite mercies, for granting us this miracle after almost 10 years of waiting, hoping and praying. James also praised the unwavering commitment of those who endeavored to bring the fallen fighter pilot back to U.S. soil. Goldfein echoed James’ sentiments saying Gilbert represented the best ideals of America’s Airmen. Maj. Troy Gilbert stands on the ladder of an F-16 at Luke Air Force Base, Ariz. Gilbert, an F-16 Fighting Falcon pilot, was killed Nov. 27, 2006, in an F-16 crash 30 miles southwest of Balad Air Base, Iraq. Gilbert was the standardization and evaluation chief for the 332nd Expeditionary Operations Group and was deployed from the 309th Fighter Squadron from Luke Air Force Base, Ariz.
Now, finally, a decade later, Gilbert has returned to the country he so valiantly served. At the request of his family, his remains will be interred at Arlington National Cemetery in the coming months along with the remains originally recovered in 2006 and 2012. “The memory of my five children watching their father’s flag-draped transfer case being unloaded from the cargo hold and carried by his brothers-in-arms back to American soil renews my hope for all mankind,” said Gilbert Ravella. “Attending the dignified transfer at Dover Monday night was the closest we have been to Troy in 10 years. That was bittersweet.